Several of the large email providers support "plus addressing", using your username plus a label (e.g., username+label@gmail.com) to help you keep track of who you're giving an address to and help you sort your email. Here's a Google post on plus addressing. 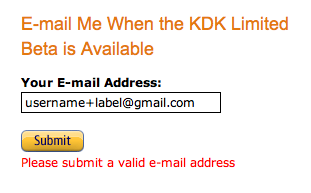 Unfortunately, many email validation routines are naive, and won't accept the plus sign. That's to be expected from Bank of America's IT department. It's a surprise when it happens at Amazon. For a better discussion of using the + symbol to help filter Gmail, see Gmail Tips - The Complete Collection.